In the latest iOS 12.2 beta, Apple has introduced four new Animoji characters that can be used in the Messages and FaceTime apps. 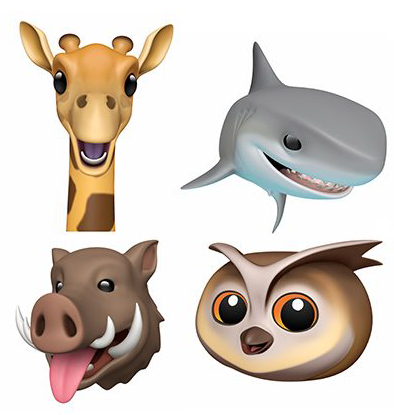 The new Animoji include a giraffe, a shark, an owl, and a boar. Animoji are designed to work on devices with a TrueDepth camera system, which now includes modern iPhone and iPad Pro models. Animoji are animated, 3D emoji characters that you control with your face. When you use an Animoji, the TrueDepth camera nalyzes more than 50 muscle movements in different areas of the face, detecting movement of the eyebrows, cheeks, chin, eyes, jaw, lips, eyes, tongue, and mouth. All of your facial movements are translated to the Animoji characters, making them reflect your expression and emotion. Animoji can be shared with friends in the Messages app as stickers and as videos, they can be used with the Effects camera in Messages, and you can use them instead of your own face when FaceTiming someone. There are a total of 24 Animoji now, including the four new ones. Existing Animoji include monkey, robot, cat, dog, alien, fox, poop, pig, panda, bunny, rooster, unicorn, lion, dragon, skull, bear, tiger, koala, t-rex, and ghost. When Animoji launched in 2017 alongside the iPhone X, there were 12, with Apple steadily adding new fun characters to play with. Nice I guess. Wish they put as much of an effort in making their gear great again to justify the premium prices. Yes, they can release these AND work on the Mac. Finally, now all the critics will shut up. This utterly pointless incrementalism will be Apple’s downfall. How many people are actually excited about this, 4? I pretty much stop using animoji after like a week or two. Regular emojis are more convenient and effective. How about providing a better voice message quality? It sounds like a radio from the 60s. Apple has lost the focus on main communication.